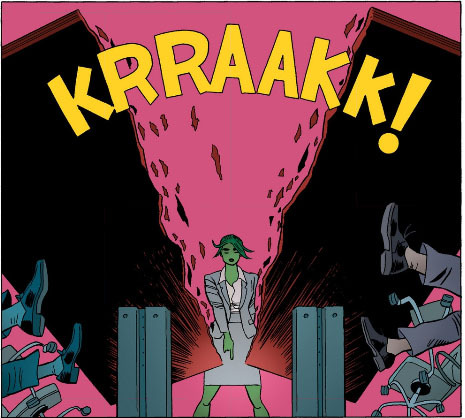 She-Hulk is a weird character. She can turn into a Hulk like Bruce Banner, but has the ability to change back at will. Then throw in the fact that she's also a lawyer, and you've got a weird bunch of traits to throw on a super hero. But watching her try to balance them is what makes this book fun. Right off the bat, the painted style cover gorgeous. So I was a bit surprised when I opened the book and see that the interior art is more of a Mike Allred/Marcos Martin type. It's great for the style of the book, but man, one of the bigger discrpancies between cover and interior art I've seen in a while. The coloring is a great kind of flat shading that works great with the style that has think black lines and very defined characters. 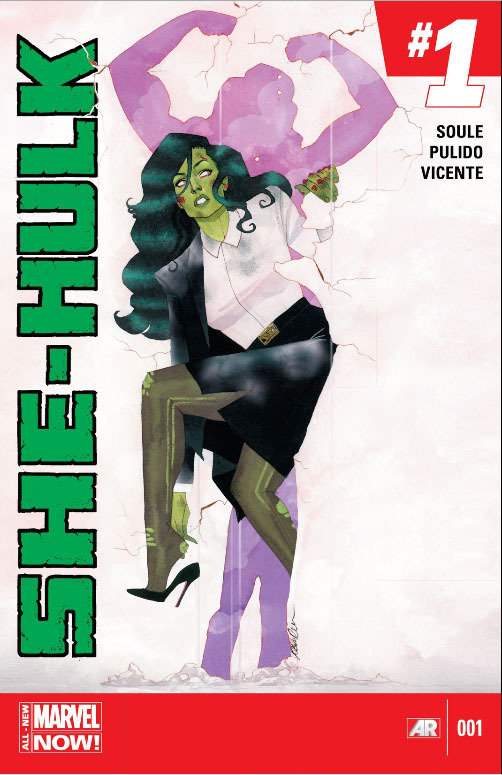 If you enjoyed Dan Slott's run on She-Hulk from a few years back (Complete Collection Vol. 1 Now Available ), you'll be able to slip right in here. Speaking of which, there some parallels to be drawn between this #1 and his #1. But anyway, Jennifer is back as a lawyer at a new firm, though things don't go exactly as she had planned. They do some great stuff with a big double page spread in the middle of the book that uses panel shapes and sizes to convey more than just some talking heads. Then there's a bit of the more usual Hulk type action that somehow feels a bit less dynamic than the standing and talking panels. In all, the art supports the writing in a way only few books pull off. 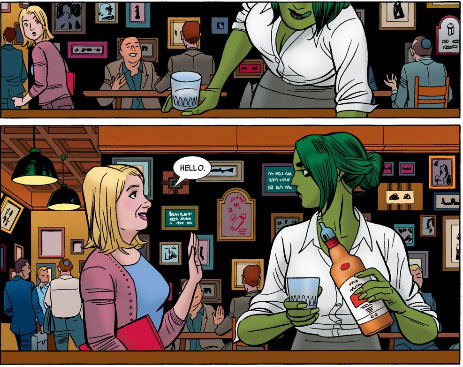 She-Hulk has always had a comedy bend to her and this is no exception. As a #1, it does a great job of getting you in the world of Jennifer and her Hulk-lawyering ways and sets the table very nicely for the story that is to follow. This acts almost as a "best of" for Shulkie. We get great comedic writing in the style of Dan Slott, and inventive art and layouts of John Byrne. I you were a fan of either's run on the book previously, you'll love jumping into this one. And if you haven't, this is a great place to start.